Reese's life forever changed the day thousands of birds started throwing themselves at airplanes, causing countless crashes. Stuck far from home and with all the planes grounded, she and David, her longtime crush make their way home to San Francisco in a rental car. But when birds strike their car, they careened right off the road and everything went black. Waking up in strange hospital a month later, Reese feels strange, which is only compounded when she returns home. Nothing is the same, especially with her own body as she starts to miraculously heal at an extremely accelerated rate. As she and David try to get to the bottom of things, what they find will be so shocking and so rooted in conspiracy there won't be any escape. Before I start this paragraph I feel the need to state that I don't have a problem with homosexuality. Granted seeing it does tend to make me a little uncomfortable, but that's my own issue not theirs, and I would never say anything negative towards their rights. That being said, I had an issue with those elements in this book. Not because they were there, but because it just didn't feel natural or realistic and as a result had my guards up that it would become a "cause" book. Looking back, I don't think that was the case, but it still bothered me the way things were handled. Granted Reese had never dated before Amber came along, but that was more due to a fear of love and attachment rather than any lack of desire for boys. In fact, before she met Amber she had a rather large attraction to David despite the fact that she didn't want to. So, it caught me and her quite off guard when all of a sudden she was gangbusters for a girl. Granted, I probably would have still been rather confused if she had of suddenly switched her attentions to a different guy, but at least that would have still been more inline with her original attraction preference. I do realize that I could be completely off base in how different sexualities work and how sudden they can change, but regardless of that I just couldn't believe the romance making it rather frustrating to me. To make matters worse things wound up turning into a twisted love triangle mess, that just didn't seem necessary. I guess things would have been a whole lot more enjoyable and believable if Amber's role had been a very good friend rather than an impromptu lover in the middle. I love sci-fi movies, but I typically try and stay away from that genre in books, unless the description really grabs me like this one did. I don't know why, but books just don't seem to get the same "pass" for believability that I give to movies. I just get so frustrated when things don't really mesh up to what is truly believable, especially in relation to how the Government would behave about something sensitive. I'm sorry but they are all about top secret stuff staying that way, so if anything or anyone would threaten that security, you can't tell me that they wouldn't be all over sealing the leak by any means necessary. I guess it just boiled down to me rolling my eyes one too many times at the credibility of the events as my frustration mounted. Even though this review shows a great deal of frustrations, I was intrigued enough by the story to make it the whole way through the book without too many distractions. This is another one of those times where I wish I rated in half increments as I'm stuck between a 2 and a 3. Since I will more than likely read the next installment to see where things lead, I'll round up to the three and chalk my issues up to a rocky beginning. Also, it should be noted that since a lot of the frustrations I had were due to believability issues, that some of them could be attributed to my mood while reading it. There are times when I'm much more forgiving of unrealistic things and able to go with the flow, but other times my mood just won't allow it. 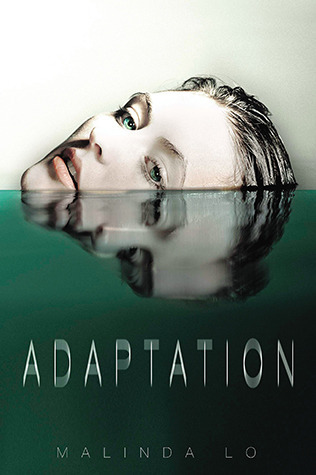 So, depending on your own preferences, Adaptation may just be a much better read for you.